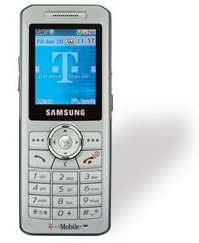 T-Mobile USA has started shipping the Samsung t509, a super-thin candybar style handset. The t509 is the thinnest handset shipping in the US, slightly beating both the Motorola RAZR and SLVR handset. While it does have a sleek profile, the t509 isn't a high-end phone. T-Mobile will be launching some other Samsung phones later in the year that pack in more high-end features, such as WiFi. After activation and rebates, T-Mobile is selling the t509 for just $49.99. It's currently exclusive to T-Mobile. MobileTracker will have a review of the handset shortly.